The share of the global public that voices a favorable view of America is on the decline. Across the 37 countries that Pew Research Center has tracked over the past several years, only in Russia has the image of the United States improved by a large margin. Elsewhere, attitudes have taken a dramatic turn for the worse, especially in Western Europe and Latin America. Global publics voice mixed views of American soft power: Most like American entertainment, but there is little consensus about U.S.-style democracy and many oppose the spread of American ideas and customs around the world. At the same time, much of the world still believes the U.S. respects the personal freedoms of its people. And most publics around the world continue to have a favorable opinion of Americans. Today, a global median of 49% hold a favorable view of the U.S. This is a considerable drop from the median of 64% recorded across the same countries in the final years of the Obama administration. In just four of 10 EU countries surveyed is the public positively inclined toward the U.S. The most widespread support is found in Poland (73%), Hungary (63%) and Italy (61%). In spite of the “special relationship” between America and the United Kingdom, only 50% of the British see the U.S. favorably. The most negative views of the U.S. are in Germany (62% unfavorable), Spain (60%) and the Netherlands (59%). And in the past year the share of the Spanish public that expresses a very unfavorable opinion has roughly tripled from 7% to 23%. Only about four-in-ten Canadians (43%) and Russians (41%) express a favorable view of America. There is strong support for the U.S. in Vietnam (84%), the Philippines (78%) and South Korea (75%). A majority of Japanese (57%) agree. But Australians are evenly split (48% favorable, 48% unfavorable). And roughly half of Indians (49%) have a positive view, although 42% express no opinion. In the Middle East, roughly eight-in-ten Israelis (81%) voice positive sentiment toward the U.S. But they stand isolated in the region. Only about a third of Lebanese (34%) and roughly a quarter of Tunisians (27%) say they have a favorable opinion of America. And roughly eight-in-ten in Turkey (79%) and Jordan (82%) have an unfavorable opinion. This includes 58% in Turkey who are very negative toward the U.S., up 26 percentage points since 2015. In sub-Saharan Africa, publics are generally positive toward the U.S. More than half in all six nations surveyed offer a favorable assessment, sometimes exceeding the share with negative views by two-to-one. The most widespread support is in Nigeria (69%). But intensity of positive opinion has waned in all six African societies since 2015: The share saying they have a very favorable view of the U.S. is down by a large margin in Senegal (39 percentage points), Ghana (35 points) and Tanzania (31 points). Compared with sub-Saharan Africa, Latin America tends to be less enthusiastic about the U.S. Only about half of Colombians (51%), Peruvians (51%) and Brazilians (50%) express a positive attitude toward the U.S. Mexicans are unfavorable by more than two-to-one (30% positive, 65% negative). And this includes 42% of Mexicans who are very unfavorable, a seven-fold increase since 2015. A s has been quite common in Pew Research Center surveys in recent years, America’s image is strongest among young adults in a number of countries. In 16 of the countries surveyed in 2017, those ages 18 to 29 have a more favorable view of the U.S. than do people 50 and older. And the differential is often quite large. For instance, young Brazilians (72%) are about twice as likely as older ones (33%) to see the U.S. favorably. The young-old generation gap is also quite large in Vietnam, France, Hungary, the Netherlands and Mexico. Views of the U.S. also divide along ideological lines in many countries. In 16 of the 21 nations in which respondents are asked to self-identify on a left-right ideological scale, those on the political right are significantly more likely than those on the left to have a favorable view of the U.S. This ideological gap is particularly large in Venezuela, where people on the right (64%) are nearly three times as likely to be positive about America as are people on the left (22%). There is roughly a two-to-one right-left divide in Australia, Canada and Sweden. And this ideological difference exists even in nations, such as South Korea, Israel and Poland, where the public overall is quite pro-American. A gender gap divides views of the U.S. in 10 of the nations surveyed. 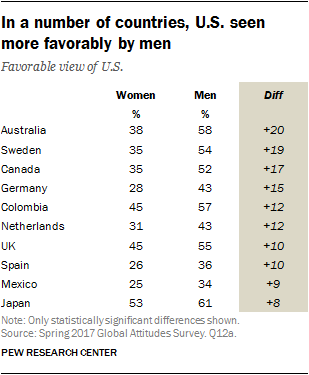 Men voice a more favorable opinion of America than do women in half the European countries surveyed – including a gender divide of 19 percentage points in Sweden, 15 points in Germany and 12 points in the Netherlands. Similar gaps exist in Australia and Canada. And there are some notable differences in views of the U.S. in select countries with significant religious and ethnic diversity in their populations. In Israel, 89% of Jews express a positive opinion of the U.S., but only 51% of Arabs agree. In Nigeria, 75% of Christians are favorably disposed toward America, while only 64% of Muslims share that view. And in Lebanon, 59% of Christians favor the U.S., while just 36% of Sunni Muslims and 7% of Shia Muslims do. America’s standing in the world’s eyes has changed markedly in a very short period of time. In more than half of the 37 nations surveyed, positive views of the U.S. experienced double-digit drops in 2017. In 10 countries, majorities had positive views of the U.S. in the recent past, but now the share of the public that is favorable toward the U.S. is in the minority. For example, in Mexico, U.S. favorability has roughly halved, down 36 points from 66% to 30%. In 14 nations the decline in U.S. favorability has been significant, but the U.S. nevertheless retains support from half or more of the public. In Japan, for instance, positive views of the U.S. have declined 15 points, but 57% of Japanese still favor the U.S. Finally, there are three countries in which America has not enjoyed majority support for some time, so any decline this year only made things worse. In Turkey, where positive assessment of the U.S. is down 11 points, it was already quite low (29%) in 2015. In only eight countries are views of America largely unchanged in recent years. There has been a large improvement in U.S. image in only one nation: Russia, where the favorable view of America is up 26 points, from 15% in 2015 to 41% in 2017. The shift in views of America has been particularly notable in several European countries. In 2016 a median of 61% held a favorable opinion across France, Germany, Poland, Spain and the UK, compared with 26% who had an unfavorable assessment. In 2017 the medians among these countries are 46% positive, 52% negative. This is the first time since 2008, the last year of the George W. Bush presidency, that these European publics have voiced more unfavorable than favorable views of the U.S. In some European countries, America’s image has also suffered more among women than men. From 2016 to 2017, favorable ratings of the U.S. in Sweden fell 37 points among women and 14 points among men. In Germany, it declined 28 points among women and 13 points among men. And it declined 23 points among French women and 13 points among French men. Over the past 16 years, whatever their views of the United States and whoever sits in the White House, global publics have often maintained a favorable impression of Americans. Today, a median of 58% in 37 nations say they look favorably on Americans. The American people are particularly well thought of in most of the Asia-Pacific region: 86% of South Koreans and Vietnamese, 85% of Filipinos, and 75% each of Australians and Japanese have a positive view. Europeans are also well disposed toward Americans: 80% of Swedes, 74% of the Poles and British, 73% of the French and 71% of the Dutch say they hold a favorable opinion. Even 56% of Russians rate Americans positively. Majorities in all six African countries surveyed see Americans favorably, including 70% of Nigerians. But these numbers are down significantly in four of the five nations surveyed in both 2017 and 2013, the last time this question was asked. The falloff has been 27 points in Ghana, 21 points in both Kenya and Senegal, and 11 points in South Africa. Latin Americans voice more mixed views of Americans. Half or more of Colombians (56%), Peruvians (55%), Brazilians (53%) and Venezuelans (50%) are positive about their neighbors to the north. But only 48% of Chileans, 41% of Mexicans and 39% of Argentines agree. Moreover, since 2013, positive opinion of Americans has fallen 18 points in Mexico and 16 points in both Brazil and Chile. Americans do not enjoy a positive image in the Middle East, except in Israel, where 76% say they have a favorable view of people in the U.S. Only 43% in Lebanon, 37% in both Jordan and Tunisia and 24% in Turkey express warmth for Americans. Low favorability has generally been the case in these nations except in Lebanon, where Americans enjoyed widespread approval for a decade between 2003 and 2013 only to have positive sentiment fall 15 points between 2013 and 2017. Soft power describes the ability of a nation to attract and persuade others through the appeal of its values, ideas and culture. American soft power has long been seen as a core strength for the U.S. However, the Center’s latest survey suggests that publics around the globe do not equally embrace the elements of U.S. soft power. To begin with, publics in most nations do not think it is good that American ideas and customs are spreading to their country. Europeans are particularly wary. Among the 10 EU countries surveyed, no majorities support such Americanization. Only about a third of the Dutch (32%) and Spanish (31%) and a quarter of the Germans (26%) say the proliferation of this U.S. soft power is a good thing. Similarly, only a quarter of Russians (27%) approve of the spread of American ideas and customs. There is even less public appreciation for American ideas and customs in Latin America. A median of just 39% think their spread is a good thing. Mexicans (26%) and Argentines (25%) are particularly unenthusiastic, with Mexican sentiment down 15 points since 2013. In sub-Saharan Africa, roughly half in South Africa (52%) and Nigeria (51%) think the spread of American influence is a good thing, but only a quarter of the public in Tanzania (27%) agrees. Since 2013, support for U.S. ideas and customs has fallen 32 points in Senegal and 13 points in Kenya. Israel (53%) is the only country surveyed in the Middle East where there is widespread support for this aspect of U.S. soft power. Just 15% in Jordan and 13% in Turkey share that view. And in both those countries such anti-Americanization sentiment has not changed much over the years. Publics in the Asian-Pacific region are generally more positive toward American ideas and customs. Seven-in-ten Vietnamese (71%) and 62% of both Japanese and Filipinos say the spread of such American attributes is a good thing for their country. Over half of South Koreans (54%) agree. But just a third of Australians (33%) and 15% of Indonesians say these aspects of American soft power are beneficial. In many countries, the appeal of U.S. ideas and customs is strongest among the young. In 21 of 37 countries, those ages 18 to 29 are more likely than those 50 and older to say such Americanization is a good thing for their society. This generation gap is quite large in Japan (35 points), Spain, Russia and Brazil (all 28 points) and Hungary (24 points). There is also a 12-point young-old divide in Mexico, despite the fact that only 26% of the overall public thinks sees the spread of American ideas and customs as good. Globally, publics – even those in well-established, liberal democracies – express diverse views of American democratic ideas. In Europe, a median of only 42% like American notions of democracy. This includes 34% in France and 37% in Germany. Such support is down 9 percentage points in France and 8 points in Germany since 2012, the last time this question was asked in Europe. About half of the public in both Italy (53%) and Hungary (52%) expresses support for U.S.-style democracy. The British, meanwhile, are divided: 43% like and 44% dislike their former colonial subjects’ ideas about democracy. In Latin America, U.S.-style democracy fails to earn majority support in any of the seven countries surveyed. Only 25% of Mexicans and 28% of Argentines like American democratic ideas. And since 2013 the share of the public that expresses approval for such American concepts is down 18 points in Mexico and Brazil, 13 points in Chile and 10 points in Argentina. Africans generally find American-style democracy appealing. Half or more in five of the six countries surveyed in that region like this aspect of U.S. soft power. At the same time, backing for U.S. democratic ideas has fallen sharply in a number of African nations even though a majority still supports them. Support is down 24 points in Senegal, 22 points in Kenya and 16 points in Ghana. In the Asia-Pacific region majorities in South Korea (78%), Vietnam (69%), Japan (63%) and the Philippines (57%) also like American democratic ideas. But only about a third of Indonesians (35%) concur. Middle Eastern countries are slightly more supportive of U.S. ideas about democracy than they are about the spread of other American ideas and customs. Nearly two-thirds of Israelis (65%) like these ideas, as do roughly half of Lebanese (52%). More people dislike than like such U.S. ideas in Jordan and Tunisia, though four-in-ten Jordanians (43%) and Tunisians (41%) do express support. Only the Turks (23%) have little faith in U.S.-style democracy. In 13 of the nations surveyed, men are significantly more likely than women to express admiration for American democratic ideas. This gender gap is particularly large in Australia (21 points: men 54%, women 33%), Sweden (20 points: men 48%, women 28%), Nigeria (17 points: men 76%, women 59%), Ghana (16 points: men 66%, women 50%), Germany (16 points: men 45%, women 29%) and Greece (15 points: men 48%, women 33%). A median of 54% in 37 countries think that the United States government respects the personal freedoms of its own people. In comparison, a median of 61% say France protects such rights, but 31% say Russia does and just 25% think China respects these liberties. Such median views of the U.S. performance mask wide regional differences, however. Most publics in the Asia-Pacific region overwhelmingly see the U.S. as a defender of civil liberties. This includes 87% of Vietnamese, 84% of South Koreans, 73% of Filipinos and 69% of Japanese. Only 42% of Indians laud U.S. defense of personal freedoms, but that may be because 45% don’t know or refuse to answer. America’s reputation as a defender of individual rights is also quite strong in some parts of Africa, where 77% of Nigerians and 68% of Kenyans say “yes,” the U.S. respects personal freedoms. But even though 60% of Ghanaians agree, that share is down 19 points since 2015. And just 44% of Tanzanians see U.S. behavior on civil liberties in a positive light, down 21 points from 2015. Many Latin Americans do not see the U.S. as a protector of personal freedoms. A median of just 45% in the region say the U.S. respects its own people’s rights, including just 35% in Argentina and 32% in Mexico. This part of America’s soft-power image has taken a particular hit in Chile, where it is down 34 points since 2015, and in Mexico, where it is down 24 points. Notably, six-in-ten Russians (61%) think the U.S. respects the personal freedoms of Americans. Such sentiment is up 20 points from 2015, when 41% held that view. In 11 of the 37 countries surveyed, perceptions of America’s record on domestic civil liberties differ by gender. Women are less likely than men to say the U.S. government respects the personal freedoms of its own people in Sweden, where the gender gap is 21 points (54% of men, 33% of women), in Canada (19 points: 55% of men, 36% of women), France (15 points: 57% of men, 42% of women), Colombia (14 points: 53% of men, 39% of women), the UK (13 points: 60% of men, 47% of women), Mexico (12 points: 38% of men, 26% of women) and Germany (12 points: 54% of men, 44% of women). For most people around the world, U.S. movies, music and television are a popular aspect of the American brand. Half or more of the public in 30 of 37 nations surveyed say they like U.S. cultural products. And this has been the case in most countries since the question was first asked in 2002. It is notable, however, that in the six Muslim-majority nations surveyed, a median of just 40% find American pop culture appealing. Europeans overwhelmingly embrace American cinema, TV programs and music. This includes 88% of Swedes and 82% of the Dutch, publics that were divided over or opposed to the spread of U.S. ideas and customs and American ideas about democracy. Eight-in-ten Australians and roughly seven-in-ten Japanese, Filipinos and South Koreans like U.S. cultural products. Only 37% of Indonesians find them appealing. Notably, Indonesians are also overwhelmingly opposed to the spread of U.S. ideas and customs. A median of 60% of Latin Americans find American cinema, music and TV to their liking. This includes roughly two-thirds of Venezuelans (67%) and Argentines (65%), two countries where half or more of the public say the spread of American ideas and customs is bad. African attitudes toward American cultural products vary. For example, they are well liked in South Africa (76%), but only roughly half that share in Senegal (36%) finds them appealing. In the Middle East, the appeal of U.S. movies, music and TV is low: A median of only 45% say they like American cultural exports. The exceptions in this region are Israel (66%) and Lebanon (62%). In almost every country, young people tend to like American pop culture more than older people. And the age gap is often quite substantial, even in those nations where both young and old find American movies, music and television attractive. The median young-old difference over 37 societies is 25%. This includes generational differences of 57 points in Vietnam, 39 points in Russia and Brazil, 36 points in France and 34 points in Colombia.